(Personal) branding has become one of the most important marketing strategy components these days: well-known brands attract links naturally, people get hired based on their Klout, and everyone googles everyone before entering any business partnership. Your brand is your strongest asset: You can rely on your brand to build up new channels and expand your reach. If you have built a brand, you’ll never have to start from scratch again. But what to do it you are just starting out? How to build up your influence and get recognized? I am sure there are many ways to do that but I’d like to focus on my currently favorite one: Participate and ultimately get featured in niche Twitter chats. The most obvious way to get invited to be the featured guest at a chat is to become a regular participant of one. There’s one more important benefit to that: Taking part in Tweet chats is one of the most efficient ways to grow your Twitter following and meaningful interactions. It’s also essential for personal growth giving you the opportunity to discuss professional and trending topics. After a few weeks of taking part in Twitter chats you’ll notice you are becoming a better Twitter user as well: You’ll learn to express yourself in fewer words, you’ll know how to formulate your tweets better to stand out and get noticed in the chat stream and you’ll figure Twitter humor and visual tricks that drive you retweets. If you are looking for marketing Twitter chats to participate in, I’ve created a Tweet chat calendar which you can easily steal. Gnosis Arts is another good way to discover Twitter chats. This kiwi breaks down Twitter chats by day of the week, subject, alphabetical lists, info by text message, and chats going on now. Taking part in a chat is easier than it may seem. Just go with the flow! You don’t need to be an expert on the topic to participate. Just ask related questions and thank for answers: That is enough to get noticed. It will get easier with time. The only obvious thing not to forget during the chat is to always include the official hashtag. It’s easier if you use a tool for that! You may want to use TwChat that makes the whole process much easier and more fun. The “Mentor’s” columns is intended for people who “host” the chat as well as for featured guests and experts the host may invite to speak to the community. 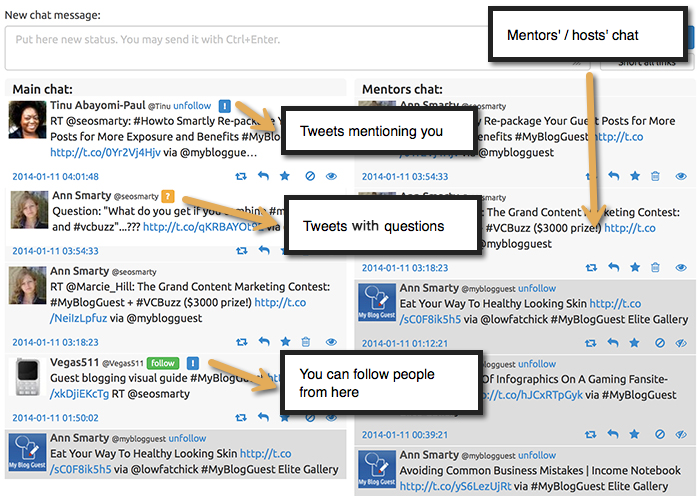 There are many more Tweet chat tools I’ve listed in this article! If you are invited be the featured guest to a Twitter chat, make sure you make the most of that opportunity! It’s not one-time thing: Your goal is to build connections that will last! Nothing will be more appreciated than your effort to promote the event: Be generous in sharing the upcoming chat with your own audience. You’ll see more people willing to invite you to be a mentor after that! I have been to some chats where there is no greeting and if there are a lot of people, you feel like you were not there. While a person can get over it, human nature dictates that you are less likely to “feel like” returning the next time, no matter how much you use logic to tell yourself to do it. I would say that offering something for free is a great way to help me check them out and remember them after the chat. There’s a lot of things going on in my day, and even though I always open the pages that they refer to during the chat, I don’t always get around to reading them. And, often, those pages get closed by the end of the day when I shut down. That being sad, if you are preparing to keynote a Twitter chat, make sure you put together some whitepapers or digital guides for chat participants to download and take home with them. This way, chances are, more of them will remember you long after the chat. The guides don’t have to be huge: Here are a few great examples of digital guides on a varied topics. It only looks tough at the beginning. If you keynote a couple of Twitter chats, you’ll be able to reach out to other prominent hosts in your niche saying something like “Hey, I’ve been the featured guest at #this and #that Twitter chat and I think I can add value to yours as well. I think your community would be interested in my perspective… Here’s the case study I published which helped me develop and test this tactic… “ and so on. 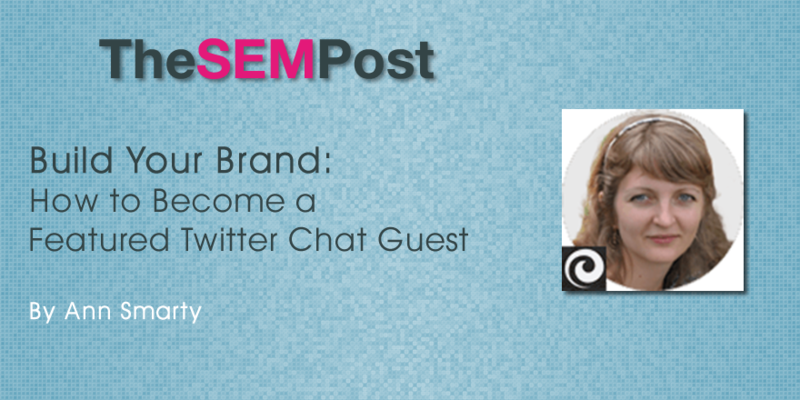 Being a Twitter chat featured guest builds your personal brand and establishes you as the niche authority, so it’s well-worth the time you invest in. And you don’t really need to be a big shot to keynote popular Twitter chats in your industry: All you need is to start working towards your goal! So true: Branding takes lots of time but it’s well worth the effort! Thanks for stopping by, Darren, and see you key-noting #VCBuzz this month! 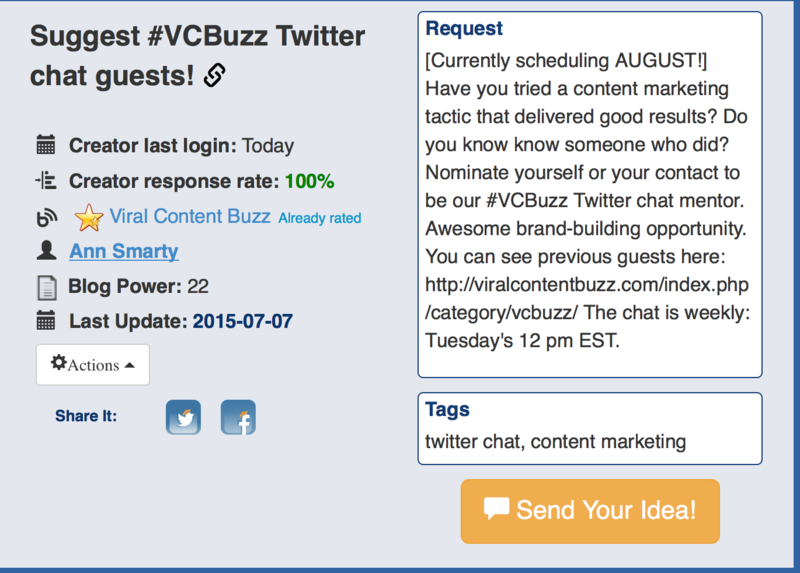 I remember my first Twitter chat mentoring was with #vcbuzz earlier this year. It’s a great feeling being a guest, and everyone I’ve spoken with from your guest list can confirm the feeling. Not just being a guest, but for the beginning, being active and engaging can build your brand too. I started a while back with #myblogguest, and now I’ve lost count to how many chats I actively participated. Loved your article and tips, Ann. You did great as a featured guest, Roxana! We love to see you at all our chats!